Most of the surgical procedures in hospitals and health centres across the country are performed by health workers who are not surgeons, a new study has revealed. 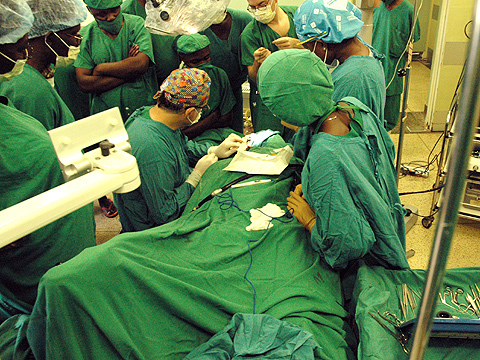 A study conducted by researchers from the College of Health Sciences of Makerere University has disclosed that there are only 200 surgeons out of the 2,105 registered doctors in the country. This, he said, means there is only one surgeon for every 400,000 Ugandans. An associate professor of anatomy (structure of the human being), Sam Luboga, who led the study said yesterday that crucial surgical operations continue to be conducted by nonsurgeon physicians and non-physician clinicians in general hospitals and health centre IVs. Luboga was launching a programme that will see surgeons from the college give necessary surgical skills to general doctors in the country’s hospitals and health centres. He said some of the surgical theatres are redundant at the hospitals. He blamed the high maternal mortality rate, high fatality rate from injuries and other surgical emergencies, high prevalence of surgical preventable disabilities, unnecessary referrals to regional and national referral hospitals, heavy surgical work load and limited access to lifesaving surgical services to shortage of surgeons. For one to become a surgeon, they must have pursued a master’s degree in surgery for three to five years after an undergraduate degree in medicine. Luboga who said surgeons are concentrated in urban areas attributed the shortage to brain drain as a result of low remuneration in Uganda, long training periods and few institutions offering the specialised training. Luboga noted that the project will improve the access to quality surgical services, reduce mortality rate and disability attributed to surgically treatable conditions. The college students also announced a plan to start offering free screening services to young women for cervical and breast cancers.